Summer is here – and so is the ice-cream man! 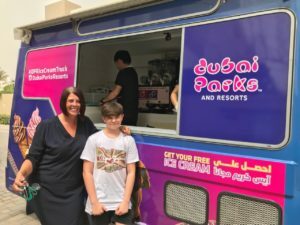 To escape the blistering temperatures, Dubai Parks and Resorts, the largest multi-themed leisure and entertainment destination in the Middle East, is giving out as many as 2,000 free ice creams to kids and families in select neighbourhoods across Dubai, Abu Dhabi and Al Ain for two weeks, until 13 August. The destination, comprising four separate parks MOTIONGATE™ Dubai, LEGOLAND® Dubai, BOLLYWOOD PARKS™ Dubai and LEGOLAND® Water Park, have a roaming ice cream van distributing fruit ice lollies and soft ice creams. The van started travelling across select communities in Dubai from July 31 and will continue until 6 August and will visit Abu Dhabi from 7 to 13 August as well as Al Ain from 10 to 11 August. To check if the ice cream man is coming to a neighbourhood near you, visit Dubai Parks and Resorts Facebook and Instagram pages for more details – and make sure you are there to get your scoop of the season’s best flavours! Also, snap a selfie with the ice cream van, use the hashtag #DPRIceCreamTruck and stand the chance to enter a raffle draw to win four tickets to the destination’s four theme parks.